8/18/15 - When you love someone, you love every part of them...even great sickness. This morning as I lay with Rana, I find myself thinking about all we've been through together and all things that may come. Kissing her precious bald head and holding her weak hand, I soak in this moment as she nuzzles closer to me to find comfort and safety. Tears of gratitude stream down my face as I pray silently to God on her behalf as waves of nausea pass. I know God hears me because I feel his presence. Laying my hand on Rana, I claim victory in Jesus and I thank him for walking with us in this season. I rebuke Satan over and over again because I am faithfully believing God is able to heal her to his glory. I will not give up the fight and I will not stop praying because to do anything else is impossible for my heart to understand. My dear friend Kathy Mashburn wrote this about her sweet daughter Rana just yesterday. As I'm writing this tonight, she is in the ER at T.C. Thompson's Children's Hospital in Chattanooga, TN waiting on fluids to replenish Rana's frail body. July 13, 2015 started out as a normal day but as Kathy watched her daughter grow sicker and sicker, she knew something was wrong. That's the day Rana was diagnosed with HLH, a life-threatening autoimmune disorder. This is Rana's senior year of high school. She is 17 years old. 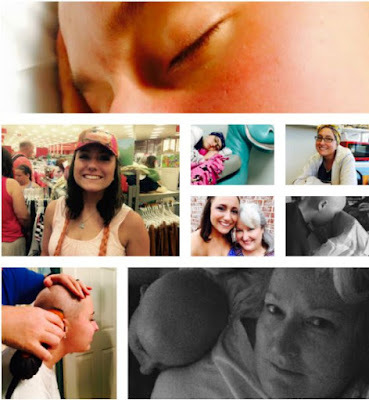 She receives chemo to suppress her immune system which has caused her hair to come out. She is still glowingly beautiful! Kathy has been widowed about five years. Her husband passed from a long illness with a heart disease. Kathy is one of the strongest and most talented people I know. Two weeks before Rana's diagnosis, Kathy and I were scheduled to have lunch. We rescheduled due to conflicts. I just can't believe how drastically and quickly her life changed.. My heart weeps for this family. They are constantly in my thoughts and prayers. I wish I could do something great for Kathy and Rana. All I can do is wait on God as they are faithfully doing. I have opened a Pampered Chef fundraiser for them at www.tinyurl.com/ranastrong, 15% of your purchase will go directly to Kathy for expenses. Rana has labwork several times a week and chemo 50 miles from her home. Kathy can't work, Rana requires too much daily care. Cash donations are also accepted via Paypal at tammy.stafford@hotmail.com. If you feel compelled to help this dear mother and daughter, please don't hesitate, do it now! Our world changed quickly March 2012 when Steve was diagnosed with an autoimmune disease causing pulmonary fibrosis. The doctor flippantly said "You've got 3 to 5 years." The news is like being on the playground on the merry-go-round on an extremely hot day. One minute you're having so much fun and the next minute, you're nauseously ill, wondering when it will stop and praying it never does. So scary and unsure. God is our refuge and strength. He is the giver and taker of life, not a doctor. Please don't neglect to thank God every day for your health and well being. You just never know when something like this could happen to you or yours. For more information on HLH and Kathy, please click the links in this article. Thanks in advance for your prayers, donations and kindness. Follow updates for Rana on Facebook at RanaStrong or on Twitter using #ranastrong.